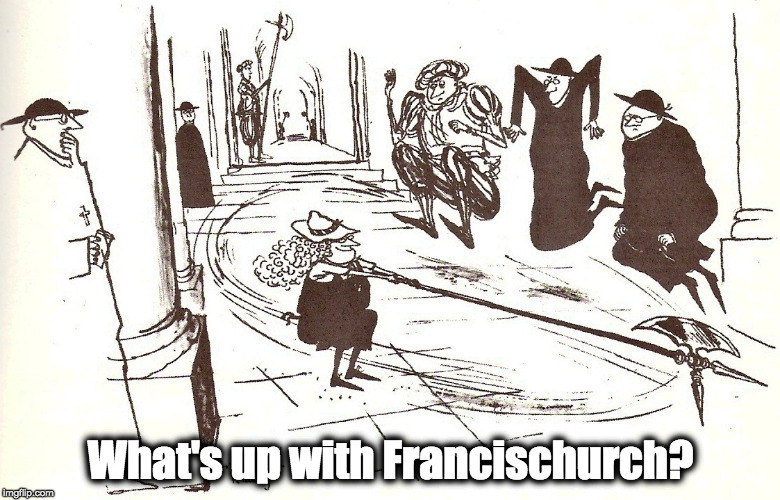 More kind notes, and requests for prayers: blegging posts continue – What's Up With Francis-Church? And He said to him: What hast thou done? The voice of thy brother’s blood crieth to me from the earth. We all know by now that Alfie Evans died early this morning. Listening to the Virgin Radio news at noon in Italian, and Alfie’s death was the top of the charts. At least this country cares. Thank God, at least for that. Ordinary, simple people, people who have not been corrupted by immersion in “modern education” are still sane. There are going to be a lot of people talking about it. I’m not sure how much more I’ve got to say. I and people like me who have been doing this kind of work have been saying these things for a long time, and are pretty much talked-out. But a few things come to mind, which I’ll be sharing later today, I hope. But for the moment it’s probably a good idea to let our brains sort things through for a bit. Off to Perugia in a few minutes for a walk and then Mass. I’ll be popping into the Duomo for a bit, and I’ll keep y’all in mind. Pray today for Tom and Kate and all the people whose names we don’t know who are in the same situation. One of the few consolations for having to beg for donations is hearing from people in a more personal way. Thanks to all who have donated so far. I thought I’d share some of the responses, since some of them come with specific prayer requests. I had the blessing of staying at the ICKSP seminary for a week in ________ for an ordination by Cardinal Burke. I’ve never felt like I was in a more sane place. Those views of the Tuscan countryside didn’t hurt either. Reading your blog always gives me a little reminder of that sanity, so thanks for that. I’m in my last year of residency training here in ________, looking ahead to a job at a godless ________ hospital under the thumb of our very own version of the NHS. As I get closer to that, I can’t help but think I would have have been much happier as a small-time potato farmer. Spare a prayer for me, if you get a minute! Work on developing a serious interior life, I recommend it because except for the writing abilities, you’re a lot like me; all I can say is it works. Might as well give it a try. Click here to donate. And many thanks.